In our experience trying to find accommodation when travelling solo can be a frustrating and expensive business. 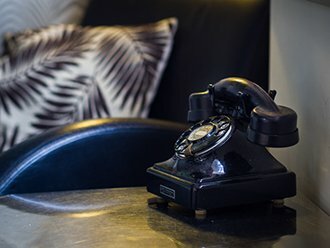 Here at The Old School we think we’ve solved that particular problem and offer what must be amongst the best value single rooms anywhere in the land. 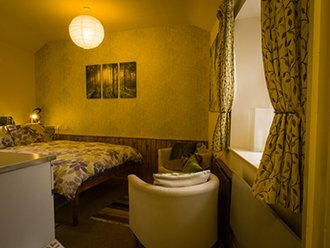 Your own room with en-suite shower, comfy memory foam mattresses, far from bland decor AND a breakfast which includes organic ingredients…for only £30 per night! In a hurry? The important bits are underlined. We offer 3 of our rooms as single rooms. Also early and late in the season (and at other times at short notice) we may be able to offer further rooms at the single rooms rate. Phone us and we’ll see if we can help. All single rooms are carpeted, have en-suite showers that are powered by solar thermal and green electricity and a wash basin. All bedding and blankets are supplied and beds are made up for you with a duvet and 2 pillows. The good quality beds are of solid wooden construction and have comfy memory foam mattresses. Plus there are storage facilities for your belongings. 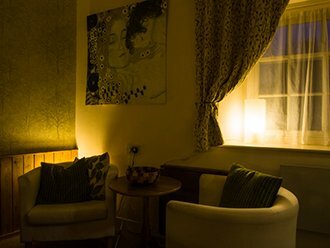 Our single rooms are not large but we’ve tried to think of those extra touches that are so often lacking in budget accommodation – hooks where you need them, quality blackout blinds at the windows that don’t let in the light when you’re having a lie in and a hot water bottle under the bed. There’s a handy shelf by the bed with a selection of short stories and a reading light too. Regular guests often have their favourite single room. We will always try to accommodate you in the single room of your choice if you have a preference. 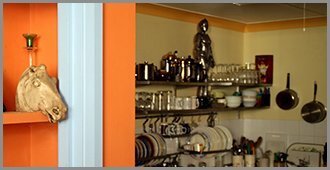 Also, don’t forget that one of the best features about hostels compared to traditional B & B’s is that there’s a well equipped kitchen for you to use so you can save £££’s by not having to go out for every lunch and evening meal. It’s nice to treat yourself and eat out on occasion but sometimes it’s equally pleasurable to cook exactly what you fancy and you can do just that here at The Old School Hostel. You know how that £60+ per night single room can sometimes be tucked away somewhere at the back with a view of the rubbish bins?! 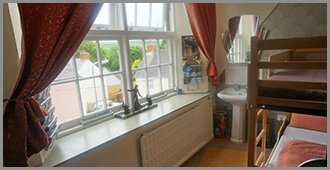 For half that price our Single Room 1 has a nice big sunny south facing window with a view over pretty cottages to the countryside beyond. It has a bunk bed with good headroom and the lower berth made up for your arrival. (Just let us know in advance if you’d prefer the upper berth.) This single room features all the facilities detailed above including an en-suite shower and in addition has a comfortable leather armchair and foldaway table to write or snack on. Budget accommodation can be a bit bleak but we’ve had a lot of fun with the decor in Room 1. It’s decorated in swanky 1930’s Art Deco style with features and attention to detail that wouldn’t look out of place in a top end boutique hotel. Bed and light breakfast in a budget room like no other is £30 per night. Click on the prices tab for the single room tariff. This is a cosy room featuring a bunk bed with a 4’ wide ‘king size’ single lower berth’ (It is actually a small double). There’s an en-suite shower and basin. Also a folding chair, flap down table and storage facilities, plus all the features and little extras mentioned above. All our rooms are bright and cheerfully decorated and are themed. Room 4 is ‘Pictures and Stories’ with every picture on the walls having a story to tell. See below for our favourite. For the room tariff for a single room click on the prices tab. There are lots of intriguing paintings and posters adorning the walls of the hostel and many of them have a story to tell. Our favourites are in Room 4. 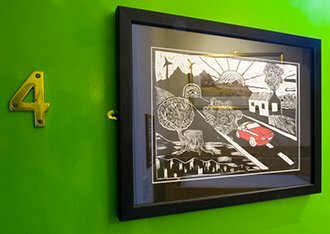 The accomplished framed woodcut on the door was made by Tom from France, one of our lovely volunteer helpers who stayed with us a couple of years ago. 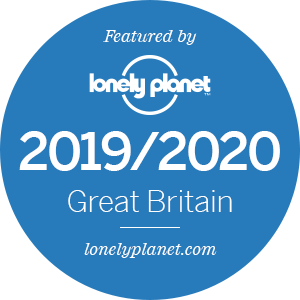 We’re proud of the fact that The Old School Hostel is one of the greenest places to stay in Wales. (And Chris has got a mug that says ‘Eco Warrior’ on it that proves it!). One day Chirs popped out to buy some cat food and there it was in the car park, all shiny and red and with a little note on it saying ‘only 5 owners including a vicar. Bargain. 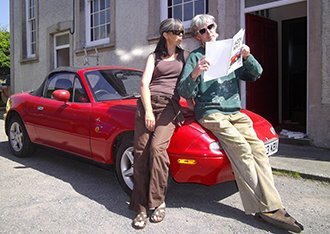 £1,500.’ Well, bargains are what we are all about so, a day or two later, Chris joined that happy throng of grey haired chaps in old open topped cars. He was in pretty big trouble when he got home that night though. The woodcut, with its flamboyant plume of exhaust and the tunnel entrance with its all seeing eye says it all really. 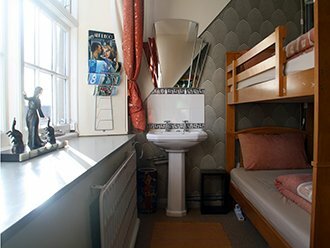 ‘Ty Popty’ means Bake House in Welsh and is a quaint little self contained room separate from the main hostel building. It’s where the school dinners used to be cooked many moons ago. It has full en-suite facilities, a kitchenette, comfy tub chairs and a double bed. It offers perhaps the best of both worlds. Guests have the privacy of their own self contained room but usually also have access to the main hostel premises. Here aremore extensive kitchen facilities, a drying room etc. and the opportunity to socialise with other guests. See the Self contained Studio Room page for full details. Early and late in the season Ty Popty is available as a single room at very attractive rates. Even in high season our standard tariff for solo travellers is just £45 per night here in your own snug little holiday home for one, located in a National Park just a short stroll from our spectacular coast. See our ‘Special Offers’ page or contact us direct for our best deals. For single occupancy rates for ‘Ty Popty’ click on the prices tab. The minimum length of stay for ‘Ty Popty’ is normally 2 nights unless we are filling in gaps in bookings. 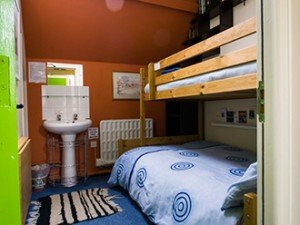 If a group has booked the hostel for their exclusive use please note that guests in ‘Ty Popty’ will not have access to the facilities in the main hostel premises. Note: Ty Popty is a self contained unit separate from, but close to, the main hostel building. Guests may prefer the privacy that ‘Ty Popty’ offers and can, of course, choose to self cater. ALL RATES INCLUDE A LIGHT SELF SERVICE BREAKFAST OF SELECTION OF CEREALS, QUALITY MUESLI, SELECTION OF PORRIDGES, CHOICE OF QUALITY BREADS FOR TOAST, BUTTER OR DAIRY FREE SPREAD, JAMS, MARMALADE AND MARMITE, FAIR TRADE TEA AND ORGANIC FAIR TRADE COFFEE AND ORGANIC WELSH MILK. All ingredients as available. We always try to accommodate guests in the room of your choice if you have a preference but once in a while we need to make alterations so cannot guarantee this. Rooms 1 and 4 we occasionally transpose for example. If we do need to alter one room for another it will be to a room with similar or better facilities. For example, we may upgrade you to a room with a double bed..